Selina helps dismantle a tree for an arborist. 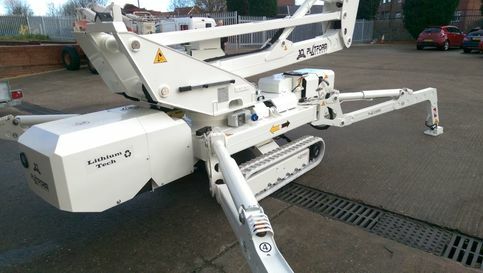 One of High Reaching Solutions regular clients, N Dean Tree and Garden Services of Malton, North Yorkshire, had the task of dismantling a very dangerous tree which was unsafe to climb and so requested the services of ‘Selina’, our 22m tracked spiderlift to help them do it safely. The tree was rotten in the centre and was in danger of falling and although situated in a garden the tree was awkward to get to and no other form of cherrypicker could get close enough to do the job. Nick has used ‘Selina’ on many occasions and found her controls precise and easy to use, along with her adjustable track settings to get through narrow gates and her adjustable leg settings enabling setting up in tight and awkward areas very beneficial. Being only three tonnes in total weight which is spread over the area of the tracks whilst travelling and then over the footprint when her legs are down gives a very low ‘point-loading’ and therefore leaves very little evidence that she was even there, which is a bonus for all concerned. On this occasion Nick and his team took a time-lapse video of their work to show the dismantling of this large tree and have kindly given us permission to share it on our website. We hope you find the video both interesting and entertaining and should you require the services of Nick and his team I’m sure he will welcome your enquiry, you can contact him on 07855 780512. If you think High Reaching Solutions can help you overcome a problem then please either give us a call, email us via the contacts page or leave a comment below.